The classic combination of sweet pears and salty ham. This makes a nice winter starter for entertaining guests and you can poach the pears in advance so there’s not too much to do when they arrive. Wine Suggestion: with the combination of fruity/sweet pear and the salty ham this choice wasn’t immediately obvious, but an inspired guess lead us to Sparkling Moscato. We had a bottle of the Quady Electra, a Moscato from California that danced with this dish but you may find it easier to get a Moscato d’Asti (the most famous region for this style) or a local equivalent. The Moscato is low alcohol, and refreshingly fruity so perfect to start off a lengthy meal. Put 600ml of water into a saucepan over a medium heat with the sugar, vinegar and bay leaves. Bring to the boil, then simmer until the sugar has dissolved. Toast the pine nuts in a dry frying pan but keep a careful eye on them as they turn from golden to blackened in the blink of an eye. Peel the pears and try to leave the stalks intact. Trim the bases a little so they stand up nicely. Add the pears to the liquid and simmer until tender, turning them over in the liquid now and then. This can take anywhere from 10 to 25 minutes (depending on the size and ripeness of your pears) so you will need to keep a watchful eye. Remove from the liquid and allow to cool, then wrap each one in a slice of ham. Season the liquid with salt and plenty of black pepper, then boil until it becomes a thick syrup. Arrange the salad leaves on 4 serving plates. Put a pear on top of each and scatter over the toasted pine nuts. Mix the balsamic syrup with the tablespoon of olive oil and drizzle over the top. It’s endive season but what to do with it? This is another gem from Ottolenghi: the cookbook. You can prep it all in advance and finish it in the oven when your guests arrive. Our favourite starter for February! Preheat the oven to 200C/Gas 6. Get your largest frying pan to caramelise the endive in. You will need to do it in batches as they must be able to sit flat without touching. So put half the butter and sugar in the pan and put it over a high heat. Stir to mix. As soon as the butter starts to bubble, place 6 endive halves face down in the pan and fry for 2-3 minutes, until golden. You might need to press them down a bit. Don’t worry if your butter starts to brown. Repeat this with the rest of the endive halves, butter and sugar. Line a baking tray with baking parchment and arrange the endives on top, caramelised side up and sprinkle with salt and pepper. Mix the breadcrumbs, Parmesan, thyme, cream, 1/4 tsp salt and a good grind of black pepper. Spoon this over the endives and top each one with a slice of the ham. 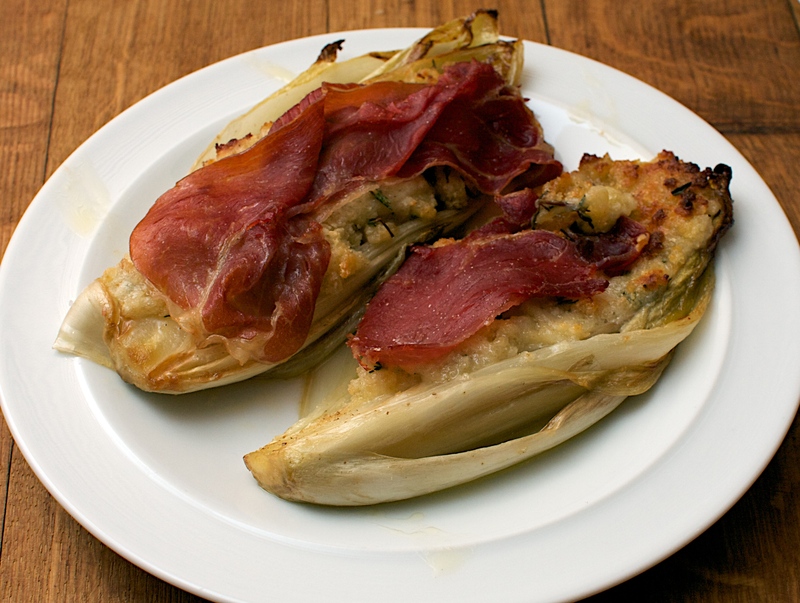 Roast in the oven for 15-20 minutes, until the endives feel soft. Serve hot or warm, drizzled with some olive oil and sprinkled with chopped parsley if you happen to have some. Wine Suggestion: This is a hard one cause the dish is bitter, sweet, salty and savoury – in hindsight we thought a Grenache might work. Try and find a light, fruity and slightly spicy example from Spain to complement the Spanish ham.